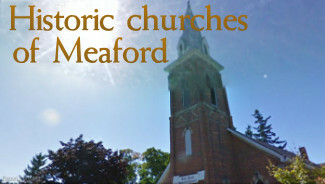 Residents of Meaford can now learn more about the municipality's architectural history and what we can do to protect it by visiting www.heritagemeaford.com. The new website offers visitors the opportunity to discover the history of exceptional buildings within the municipality; learn what Meaford is doing to protect heritage; and participate by offering their own input or by joining Heritage Meaford � our local branch of the Architectural Conservancy of Ontario. Photographs and descriptions of significant heritage buildings, homes and churches in Meaford, along with the opportunity for people to submit their own photos and write-ups. A review of Meaford's approach to heritage properties. Additional heritage resources and links. The site is in its early stages, and Heritage Meaford invites people with an interest in the municipality's heritage architecture to contribute their ideas, articles, and descriptions of properties we should celebrate and maintain. "Our heritage buildings are an important part of Meaford's attractiveness to visitors, and an important part of the municipality's economy," says Heritage Meaford vice-chair Fred Kennedy. But he warns that without protections in place, this invaluable resource is at risk. In 2003, notes one article on the site, "Toronto architect Catherine Nasmith wrote in Built Heritage News that 'Meaford has a wealth of heritage buildings and an astonishing lack of heritage protection in place to preserve them.' Eight years later, this is still true." 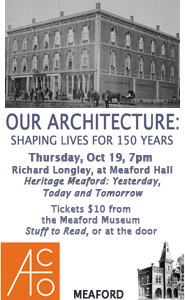 Heritage Meaford was established as a branch of the Architectural Conservancy of Ontario in 2000 with the specific objective of preserving the historic Meaford Hall, its neighbouring Fire Hall and the Meaford Museum. The organization secured substantial public funding through Ontario's SuperBuild program to fund the restoration of Meaford Hall and the Meaford Museum. The group also raised more than $100,000 toward those restorations from private donors in the community, and a representative from Heritage Meaford served on the Municipality's Board of Management which oversaw the fundraising and restoration. The group also aims to encourage the preservation of rural buildings and significant landscapes within the municipality. "Old barns and outbuildings are important reminders of our pioneer past. And our scenic vistas are a big part of our attraction for tourism," says Kennedy. "Heritage Meaford believes in practical preservation advocacy," he adds. "We're committed to working with the municipality, with Council, with local businesses, and with the community to realize Meaford's heritage objectives as they're outlined in the Official Plan, the Community Improvement Plan, and Meaford's Economic Development Strategy."